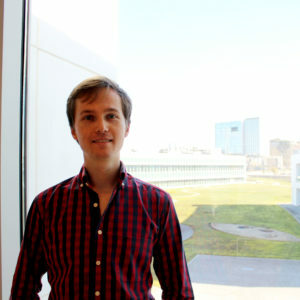 Tim is working at INL since February 2018 as a Staff researcher on the project “TMR devices operational limits”. His research focuses on electrical and thermal transport in magnetic nanostructures. Tim graduated with PhD degree in Physics in 2014 at the University of Hamburg. The emphasis was on the spintronic and thermoelectric properties of electrochemically deposited nanowires, displaying anisotropic magnetotransport and giant magnetotransport effects. In July 2014, Tim joined INL to extend his work towards magnetic tunnel junctions. This included measurements of the spintronic and spin-caloritronic properties of the magnetic tunnel junction. This work leads to a better understanding of the temperatures profile in such nanostructures and thermal properties of the tunnel barrier – both published recently.